There was nothing special about that day in May 2006 when the LSU Foundation received a letter with a Santa Cruz postmark. But what was in the envelope was very special. Emily Maloney, a California attorney, wrote to tell the LSU Foundation that Mr. Herbert Wiener, a 1941 Agriculture graduate, had passed away and left a significant percentage of his estate to the LSU Foundation. The estimated value of the gift was around $2.6 million. Born in Newark, New Jersey, it's not clear how Mr. Wiener made it to LSU. However, he was interested in "natural organic endeavors" by the time he entered college. He planned to work for the U.S. Department of Agriculture. 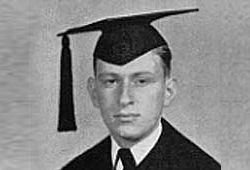 When World War II started, he left school and went into the medical corps. After the war, he returned to LSU, which he called a "poor man's school." Total expenses including room, board, books and travel from Newark to Baton Rouge for two semesters cost $400. At LSU, he changed his major to landscape design. His experiences with botany in college and with human structure in the medical corps led Weiner to develop a clear perception of organic growth. "I got a sense of how nature puts things together," he said. He enjoyed hiking in the Louisiana woods. Never married and with no heirs, he spent the majority of his career in public service, working for the federal government. He retired to northern California and spent the last years of his life in a residential center in Watsonville. He developed a fondness for and an expertise in wood sculpture. This interest was fueled with one of his Louisiana wood walks when he discovered a unique piece of black walnut. "I carried that piece of wood with me through the years," he said. "I'd work on it a while and put it away for 10 years, then pull it out again." In 1992 he finally finished the sculpture, which is now on display for his fellow residents of the Resetar Residential Hotel. "He thought hard about his estate and how to allocate his assets," Ms. Maloney said. And this is evident in how the estate was distributed. A small percentage was spread among various Jewish organizations. The remaining went to the LSU Foundation, five percent to create an endowed scholarship in Landscape Architecture and the remainder to establish an endowed fund to be used by LSU for the primary purpose of researching environmental matters with the aim of foreseeing, preventing, or finding alternate means of solving or minimizing environmental and ecological problems caused by human needs and activities. "I wish I had the opportunity to meet Mr. Weiner, shake his hand and personally thank him for his support of LSU," said LSU Foundation President and CEO William G. Bowdon. "His generosity and foresight will benefit students in the years to come." Gwen Fairchild, Director of Planned Giving for the LSU Foundation notes, "On occasion, we have donors who have the LSU Foundation in their will and we do not know about their generosity. Most are humble people who do not want attention. When we learn of a gift after the fact, the LSU family has missed an opportunity to personally thank a friend for thinking of LSU and to invite them to be a part of The 1860 Society." Fairchild added, "We often know when a donor has left a percentage of his or her estate to the LSU Foundation. What we don't know is the value of that percentage, such as with Mr. Wiener." Mr. Wiener's love affair with nature came full circle when, under an azure sky on July 13, 2006, his remains were released to the tranquil Pacific Ocean off the rocky Santa Cruz coast. About The 1860 Society: The 1860 Society recognizes those who have provided for LSU Foundation in their estate.